The fall from grace of Parmalat founder Calisto Tanzi has been as quick as it has been shocking. In little under a month, one of Italy's flagship companies has been placed into administration and Mr Tanzi has gone from plush boardroom to police cell. Investors both big and small have watched slacked jawed as a gaping hole has been revealed in Parmalat's accounts. But those wishing for a swift end to what many are calling Europe's biggest ever financial scandal may be disappointed. As of yet, no official charges have been levelled against the 65-year-old Mr Tanzi and even if they are, lawyers are predicting that any trial will be a long and expensive affair. The Italian government has acted quickly to reassure concerned voters that the problems at the dairy company will not mean job losses, but it may find the country's complex and overburdened legal system a trickier proposition. In the US, where accounting scandals prompted a global sell off in shares, investigations and court cases involving executives at Enron and Worldcom are still going on more than a year after the cooked books were uncovered. According to Robert O'Daly of research company the Economist Intelligence Unit, the legal process in Italy is "generally slow and complicated". "If it's years for Enron, then it will be a lot longer for Parmalat," he said. One of the main problems facing investigators is the amount of potential evidence they may have to gather as the alleged fraud is thought to have gone back as far as the 1980s. Further complicating matters is the size and reach of Parmalat, which employs 36,000 people and has operations and bank accounts across the globe. Getting information from countries outside of the European Union and US may prove to be a time-consuming headache. And even with all the best will in the world, just the simple task of photocopying documents for submission to the courts and legal teams can take an excruciatingly long time. The one thing that may help speed things along is the apparent willingness of Mr Tanzi to co-operate with Italian authorities. He has already admitted "diverting" 500m euros from Parmalat to help fund a travel company and according to reports on Tuesday has said that the company's missing money may be as much as 8bn euros. 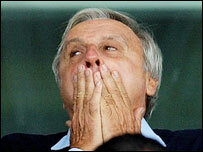 He has, however, denied any role in covering up the losses, pointing the finger of blame at top managers instead. While the rumour mill has been cranked into overtime during the past few weeks, the truth according to some observers may be far more boring. The demise of Parmalat may have simply been bad business decisions by the man who dropped out of university and took over a family business at the age of 22 following the death of his father. Often portrayed as a sober man who loved worthy causes and preferred to drive himself to and from the office, Mr Tanzi may have fallen foul of the largesse he is said to have eschewed. Realising that there was money to be made selling milk not just in Parma, but to other northern Italian cities such as Genoa, Mr Tanzi set the family's small ham and cheese shop on a road of rapid expansion and innovation. Parmalat was one of the first companies to use UHT technology and package milk in square Tetra Pak containers and in the early 1970s spread abroad to South America. After floating the company on the Milan stock exchange at the start of the 1990s, Mr Tanzi was feted for producing rapid growth and building a company that could rival Italy's other family-grown concerns such as Turin-based carmaker Fiat. And with power and respect in Italy there comes football. After buying Parma football club, Mr Tanzi invested in other squads in countries including Russia, Mexico and Brazil. 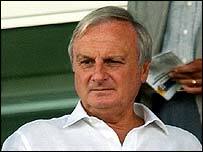 Not satisfied, he ventured into television, spent heavily on adverts with stars such as racing driver Niki Lauda and started building new headquarters outside of Parma. All that came to an end when Mr Tanzi returned from Spain over the weekend and was taken into police custody. While it is not clear how long the questioning will take, the media-shy businessman will now have to live in the glare of publicity until the complex web of financial holdings and offshore accounts is finally unravelled.